Prensa 30T, the new standard in bench-top presses from Micron Labtech Instruments, creates the highest-quality pellets on the market in less than 60 seconds. The newly designed Hydraulic Power Unit (HPU) with high-strength, low-friction Teflon seals gives the system durability with extreme smoothness. Compare this to the current swinging bridge technology common to most full-sized presses that utilize, as their seals, leather packing cups, which begin stretching and cracking almost immediately. Single integrated unit with cylinder head, control valve assembly, and oil storage tank: reduces weight by 40 pounds while cutting total cost and build time. Integrated 12″ touch-screen programmable logic controller (PLC): the “brains” of the device, actively monitors and adjusts the valving dozens of times per second to maintain smooth control of the entire pelletizing process while providing large, easy-to-read buttons and pressure gauge, designed to be operated with only five minutes of training. All these technical advances at a weight of only 200 pounds as compared to 300 pounds or more for the AOO systems, and high-quality pellets in one-fifth the time. The Prensa 30T is the fastest, most reliable, and easiest-to-operate pellet press ever built. The hybrid swinging bridge bench-top press is the most efficient design yet conceived in an automatic pellet press. Give credit to the old timers; they had the best idea first with the swinging bridge. It took Micron Labtech Instruments to bring it to the 21st-century bench-top pellet press. 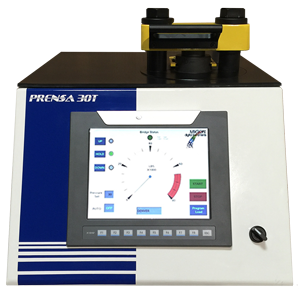 Learn more and see it in action by visiting the Prensa 30T Product Page. ...to continuously respond to changes in technology and market trends while providing you with consistently outstanding quality, value, customer service, and communication. Copyright 2019 Micron Labtech - All Rights Reserved.